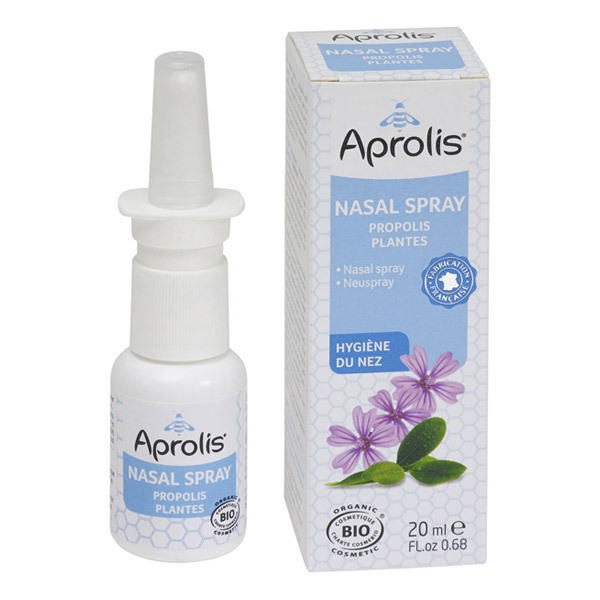 The Aprolis Nasal Spray is developed for the hygiene of the nasal cavity, it is suitable for daily nasal hygiene and sensitive nose, especially to the cold or seasonal changes. Its original composition is derived from the combination of five organic plant extracts, organic propolis and 4 organic essential oils. - Composition: organic 5 plant extracts (elderberry, purple , echinacea, arnica, marigold), organic propolis, 4 organic essential oils (sweet orange, eucalyptus radiata, ravensara, lavender) and enriched with Vitamin E natural . - Suitable for sensitive nose, excellent for colds or seasonal changes. - Product produced under HACCP (Quality = trace = safety). This product is a dietary supplement it cannot replace a balanced and varied diet! Do not exceed the recommended amount! - Prime the pump before use. - 1 to 2 sprays into each nostril, 3 to 4 times per day. - Keep cool after opening. Store in a cool place! Aprolis offers a range of food supplements and cosmetics based on propolis. Natural bactericide, propolis is a type of shield, used by bees for its cleaning properties to strengthen their habitat and clean. Propolis is also good for us humans, it has amazing cleansing, protective and healing properties! Aprolis products are based on the many virtues of propolis such as its purifying and antioxidant action, with carefully selected ingredients which are certified Cosmébio Aprolis presents cosmetics and hygiene products of the highest quality made from natural ingredients. Aprolis products are free from several harmful ingredients; they guarantee no synthetic fragrance, PEG or GMO, no sodium lauryl sulfate, parabens or phenoxyethanol. Finally, Aprolis products are not tested on animals. An ethical brand that produces natural quality products!